Figuratively representing the lucrativeness of the global respiratory monitoring devices market, a fresh business intelligence study done at the headquarters of Transparency Market Research (TMR) has detected that the competitive landscape is fairly fragmented, owing to the presence of a number of domestic and International players. That being said, a few players such as Carefusion Corporation, ResMed, Inc., Smiths Medical, and Masimo Corporation do hold a position of strength in the global respiratory monitoring market, staying ahead of the curve as a result of their impressive product portfolio, strategic acquisitions, and constant bid to expand geographically. It must be noted that in late 2016, Becton, Dickinson and Company acquired CareFusion Corporation and now has started a joint venture with Apax Partners, giving birth to Vyaire Medical. Although a fairly new player in terms of name but certainly not in experience, Vyaire Medical is now bidding for the pole position in the global respiratory monitoring market. The company manufactures more than 27,000 unique products for monitoring, treatment, and diagnosis of respiratory conditions. On the other hand, Smiths Medical oozes from a highly impressive product portfolio and technological expertise. Portex® is the brand that the company operates with, offering products such as active humidification systems, bronchial hygiene, lung expansion, and suction catheters. As per the projections provides in the TMR report, the demand in the global respiratory monitoring devices market will expand at a formidable CAGR of 8.27% during the forecast period of 2017 to 2023. 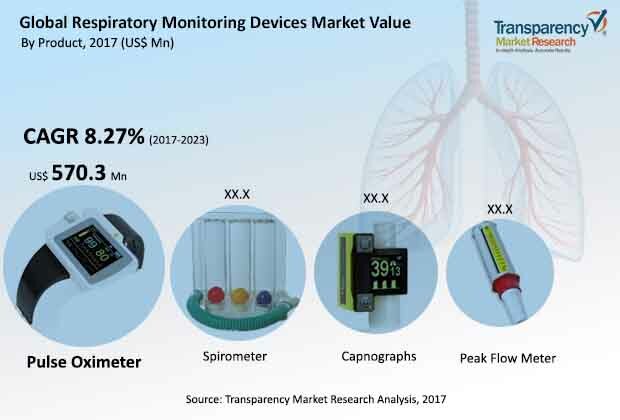 Revenue-wise, the analyst has estimated that the opportunities in respiratory monitoring devices market, worldwide, will translate into US$2,795.4 mn by the end of 2023, considerably more than the market’s evaluated worth of US$1,735.7 mn as of 2017. Based on product, the TMR report segments the market for respiratory monitoring devices into pulse oximeter, capnographs, spirometer, and peak flow meter. The report also gauges the potential of demand that can be expected out of the end users: hospitals, laboratories, and home use. Geographically, North America, Asia Pacific, and Europe have been highlighted as three regions that will maintain a strong inflow of demand throughout the forecast period of 2017 to 2023. The strong prevalence of respiratory diseases such as asthma, chronic obstructive pulmonary disease (COPD), and occupational lung diseases is the primary factor that is driving the demand in the respiratory monitoring devices market. Some of the common causes of respiratory diseases are tobacco smoking, indoor and outdoor air pollution, allergens, and workplace risks and vulnerabilities. In addition to that, technological advancements have paved way for efficient monitoring of the conditions and the products are getting adopted readily in the developed parts of the world. According to the American Academy of Allergy, there will be more than 100 million people suffering from asthma across the world by 2025. Additionally, geriatric population is increasing. This potential patient pool is expected to be a boon for the market. Although cost factors are hindering the proliferation of respiratory monitoring devices in a number of emerging economies, improving healthcare infrastructure in BRICS nations is expected to open vast new opportunities in the near future. Prevalence of COPD to drive the market in the near future.